Audi put its RS badge onto an SUV for the first time with the power-packed RS Q3. Now, this car can go even faster. Jonathan Crouch reports. Audi's Q3 might have struggled a little as an SUV, overshadowed by the bigger and more versatile Q5, but it got a shot in the arm when launched in potent RS Q3 form. Now, the standard 340PS version has been joined by an even faster 'performance' model. With 367PS on tap and quattro all-wheel drive, it'll get to 62mph in just 4.4 seconds and run on to 167mph, power deployed via a seven-speed S tronic dual-clutch gearbox. It's seriously potent. The Audi Q3 is the brand's representative in the compact part of the growing five-seat Crossover segment but the range needs a headline-maker. That's the task of this RS Q3. Here, you get a 2.5-litre turbo perol engine borrowed from the old TT RS sportscar, this offering 340PS in standard guise or 367PS in uprated 'performance' form. Either way, you've a car quite able to take on this model's direct rival, the Mercedes GLA 45 AMG. As with that competitor, here you get a four-wheel drive chassis in a car that's no longer than a Ford Focus - a recipe for fireworks. Thus equipped, the Q3 morphs from vanilla to very quick indeed. Fast SUVs haven't always hit the mark, so it's perhaps understandable that when Audi made a decision which of its range to give the RS treatment to, it chose the smallest and wieldiest model. The Q3 handles well in standard guise, with the 210PS 2.0-litre being a fun steer, but add another 130PS and the RS Q3 becomes seriously rapid. 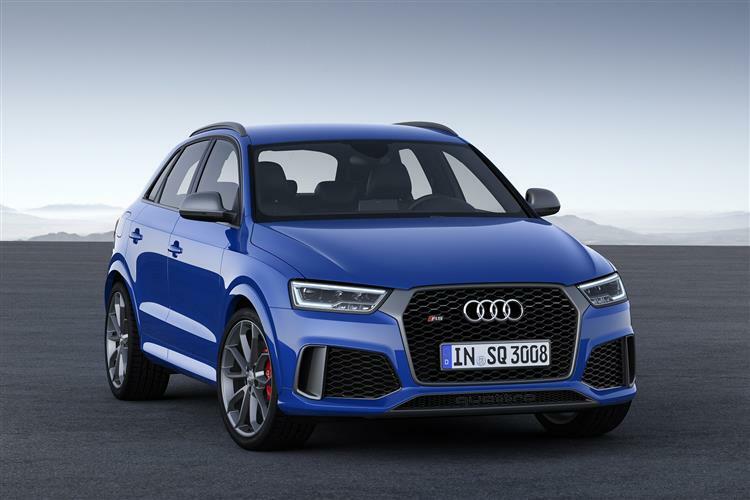 That 340PS output is enough for this Q3 to demolish the 62mph benchmark in just 4.8 seconds, with the car reined in by Audi's electronics at 155mph. Go for the uprated 367PS 'performance' version and you can improve those figures to 4.4s and 167mph. The 2.5-litre five-cylinder engine we know about, familiar from the TT RS and RS 3 Sportback. Peak power is made between 5,200 and 6,700rpm, so it likes a few revs on the board. An RS exhaust system with a switchable flap adds even more volume to the unmistakable sound of this distinctive powerplant. The 1-2-4-5-3 cylinder ignition sequence, supported by the geometry of the air induction and exhaust systems, gives that characteristic and charismatic Audi five-cylinder burble and drivers can influence the flap control for the exhaust system and the accelerator characteristic via the Audi drive select adaptive dynamics system which is fitted as standard. The all-wheel drive system uses an electronically controlled multi-plate clutch positioned on the rear axle. It works with RS-specific sports suspension which lowers the body by 25mm compared to the standard suspension. 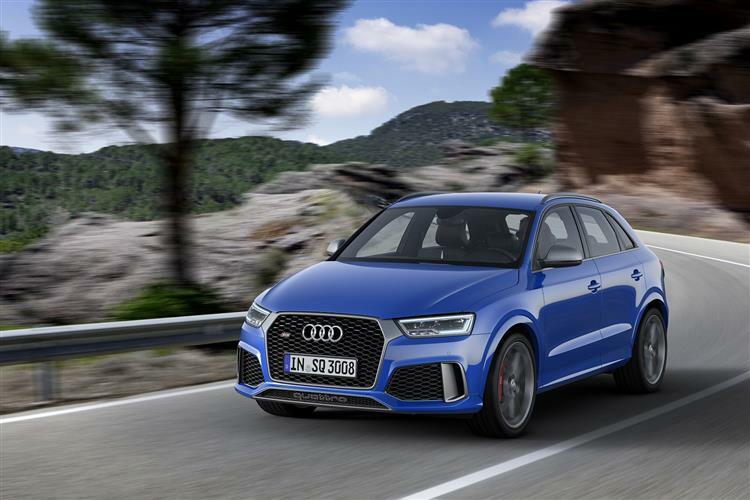 A specially tailored electronic stabilisation control (ESC) is also engineered into the RS Q3, offering a sport mode which raises the limit at which it intervenes, and it can also be deactivated entirely. Big perforated 365mm front brake discs have a wave design with wave-shaped outer contours, which saves approximately one kilogram of weight at the front wheels. These are gripped by eight-piston calipers so you've got some heavy-duty stopping power as standard. 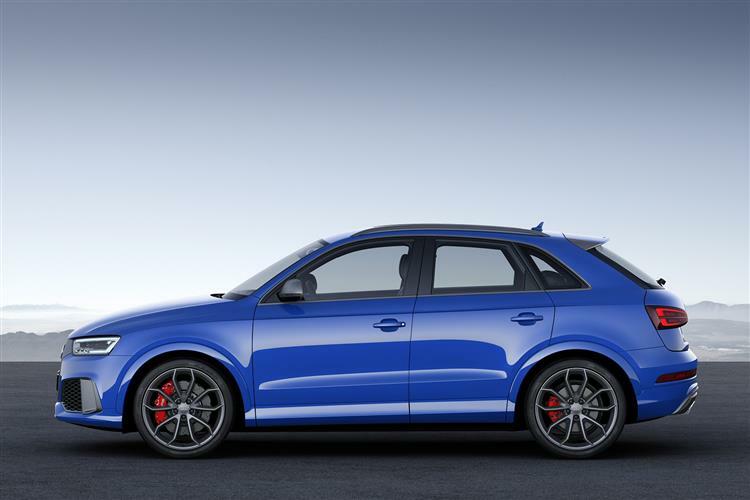 The Q3's squat, slightly bulbous styling also gets a shot in the arm with the RS model. RS-specific exterior bits include a black honeycomb front grille and RS bumpers, a quattro emblem in the air intake, a rear diffuser and big elliptical tailpipes. A roof spoiler, roof rails in matt aluminium and special door sill plates and door trim strips finish the look. An exclusive Sepang Blue pearl paint finish is also offered - at a cost. Opt for the pokier 'performance' model and you get extra matt titanium-look detailing on the frame of the air inlet duct, the Singleframe grille, the lateral flaps in the air inlets, the trim strips at the side windows, the exterior mirror housings, the roof rails, the upper edge of the diffuser and the fins of the roof edge spoiler. RS-specific 20-inch 'performance exclusive' alloy wheels with a matt titanium finish which complements the exterior detailing are standard, while red calipers bearing the RS logo are visible within them Drop inside and whichever variant you've chosen, you'll spot more RS accents. The instrument cluster has grey gauges with white scales and red needles. Contrasting grey stitching on the steering wheel and gear lever, a black headlining and aluminium pedals and foot support look suitably racy. The MMI and driver information system displays welcome the driver with the RS logo. Drivers can call up the boost pressure, oil temperature and a lap timer via the RS menu in the driver information system. The standard dash and door inlays are piano black, but aluminium race or carbon inlays are also offered. The luggage area has a capacity of 356-litres, which can be increased to 1,261-litres by folding down the split rear seat backs. Pricing is set at around £46,000 for he 340PS mdel - or just over £49,000 for the 367PS 'performance' version. 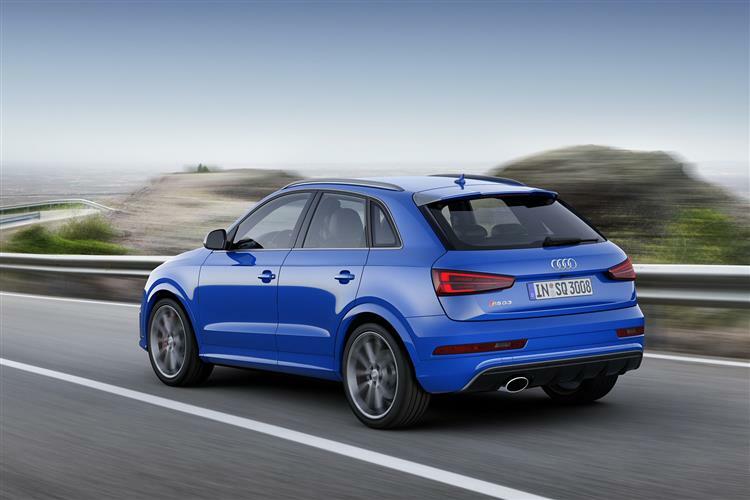 Those figures put this car into direct comparison with the Mercedes-Benz GLA 45 AMG, the RS Q3's closest rival. Standard equipment includes some quite beautiful heated leather front sports seats, a multi-function steering wheel, Bluetooth, a ten-speaker iPod and USB-compatible sound system, and voice control for radio and telephone functionality. As you might well expect, it all feels beautifully screwed together with Audi's typical attention to detail. The effect is that the RS Q3 feels jewel-like and incredibly desirable. It feels like the best bits of Audi, condensed into a manageably-sized package. If the other models that share this engine are anything to go by, fuel economy when driven in a spirited fashion can best be described as sobering, notwithstanding the impressive-sounding 32.8mpg figure Audi quotes as a combined average. 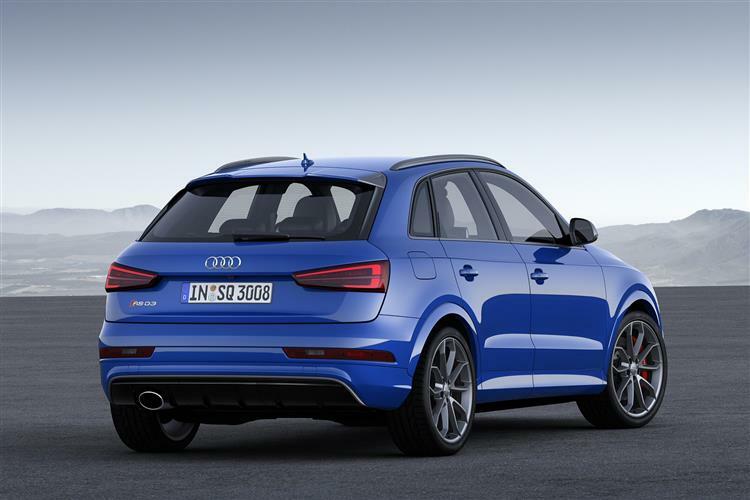 Emissions aren't at all bad as a result of this number, the RS Q3 being rated at 203g/km. That's not at all bad for an SUV with 450Nm of torque. Residual values should hold up very well. For a start it's an Audi Q3, which has performed well on the used market and most Audis with an RS badge tend to cling to their value. Insurance is expensive, so make sure you shop around as quotes vary widely. The RS Q3 delivers charisma, attitude and excitement. Yes, you'll need to dig deep for the privilege, but given that many of its rivals can be specified to this price bracket while featuring way weedier powerplants, the money asked for the RS Q3 doesn't seem too preposterous. A sports SUV is the answer to a question few really ask, but once sampled it's hard to say no. 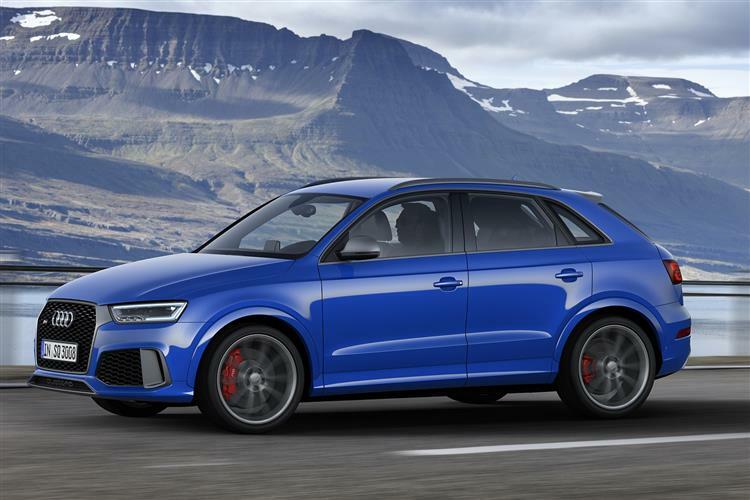 The RS Q3 is part of a new generation of downsized examples of powerful SUVs that previously only came in supersized form. It's a car that has an inherent feeling of rightness about it. It won't be for everyone, but the lucky few will find an Audi that has a certain waspishness to its nature. You'd like one.